This review was a follow up to one I wrote in the first (and only) issue of a Deep Purple fanzine I produced in 1989. I discovered it earlier today while digging out various pieces of memorabilia for a much longer piece I'm working on about the 1985 Knebworth Festival. As it is short and until now unseen by eyes other than mine I thought I'd add it to the site. I've also taken the liberty of rewriting it in a slightly more palatable style than the original. I hope to have the previous Garth Rockett review (from the fanzine) on the site soon so some of the comments here may make more sense then. The date on the ticket may say the 24th but by the time Garth and his Moonshiners hit the stage the calendar has flipped days into the 25th in this late night venue. As the music from the disco fades four shadowy figures appear quickly on stage, instruments already in their hands, raring to go. One person, the mysterious Mr Rockett, was still missing as they started with a little jam. It wasn't long until a gold jacketed figure joined them as a great cheer rose from the sweaty throng when they recognised Ian Gillan's alter ego. The outfit was a little different from the previous outing earlier in the year, no shades or T-shirt this time, and just the hint of a hairy chest to attract the attentions of the ladies in the audience. The voice however was what mattered more and from the opening lines of 'I'll Rip Your Spine Out' it was clear that there was no cold to worry about tonight. On fact the voice is pretty much perfect - better than it has been for a while - and there's little need for backing vocals other than to add depth to the tracks! Backing vocals were added anyway by Harry Shaw (guitar) with additional voices added by Keith Mulholland (bass) and Steve Morris (another guitar) whn required. Tonight I could also see the rest of the band properly and the keyboards antics of Mark Buckle on particular. He really is as wild as I was told after the last show- the lad really living up to the imprint on his belt buckle: MANIAC! He calmed down a little to link into the second track and one of my all time favourite Gillan songs, 'No Laughing In Heaven'. Between songs Garth left the stage and doffed his jacket before returning wearing a plain black T-shirt. The first track was marred a little by balance and flat sound but during this engaging song the problems were mostly sorted out. After a brief introduction more keyboards led into another song familiar from the Gillan back catalogue in the form of their infamous cover version of the Stevie Wonder classic 'Living For the City' where again the chorus was split between Garth/Harry. Moving directly on they sped into yet another Gillan band single, and Elvis song and the first one I really paid attention to on the radio, 'Trouble'. By now the crowd were jammed against the stage front and leaping wildly about. Young Mr. Buckle meanwhile is exerting himself too - climbing the keyboard mountain between him and the crowd, leaping up and down and leaning over the main bank of keyboards to reach a small set which faced the crowd. 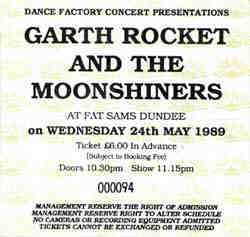 'Ain't That Loving You Baby' kept the momentum going as Garth showed his rock'n'roll roots. By marked contrast however, 'Ain't No More Cane On the Brazos' - a field lament from many moons ago - brought the mood right down and allowed Garth to show his prowess with the old lunch wrapper (mouth organ). The audience ceased their jumping and stood back to watch the band perform - or at least those involved in the track - Harry, Mark and Garth. The lunch wrapper introduced us to the next track too - 'I Thought No', a riotous song from the Gillan/Glover album "Accidentally On Purpose". Little Feat provided the original version of the next track and the band certainly 'Let It Roll' on this personal favourite of theirs, certainly enough reason to include it in the set. A few hecklers caused Garth to thank the crowd, "well almost everyone!" before presenting us with a new song just written by the band. 'Nothing But the Best' was an up-tempo little number (and destined to appear on an album the following year though the only member of this band would be Steve Morris) with the band presenting some nice harmony backing vocals - another welcome addition to the set of mostly vintage material. A slight problem with the guitars held up proceedings a little, but the roar of the crowd soon spurred the band on and they rocked into 'Unchain Your Brain', that nice little ballad powered from behind bt Lou Rosenthal on drums. Once again Mark is all over the keyboards, obviously more Emerson inspired than Lord though he made even Keith Emerson's antics look mild. At the speed that the band took the tracks the main set was soon over, but fear not, they quickly returned. Beginning with an old Hendrix riff that soon made way for something a little more off the wall in the form of 'I Can't Dance To That'. No respite as they charged straight into 'No Easy Way' which pounded us wide awake, just in case we may have felt slightly tired at 1.30am. On the home straight the boys ended with a double dose of hits, 'New Orleans' hurtling first from the PA. This was followed by a fast and furious version of the old favourite 'Lucille' to provide a fitting end to the nights proceedings. And that was Garth Rockett (aka Ian Gillan in case you didn't know) the day his departure from Deep Purple was publicised in Kerrang. I hung about after the show and produced an early version of the fanzine. An interview was out of the question because of the announcement but Ian was good enough to sign the Kerrang piece for me to use in the completed version. A sad day in some ways but the power and enthusiasm of the band proved that Gillan still had a future and a caring audience. In some ways the band seemed to have the spark that the last (1987 in the UK at least) Purple tour had lacked so I wasn't too disappointed at the split, especially of it meant another album as good as the Gillan/Glover one from the previous year. I wonder if it was indeed to find a replacement in Deep Purple for Ian Gillan? This show was part of the second tour Garth and the boys did in the first half of 1989 and the set remained fairly similar other than a touch of re-ordering. The previous one had suffered at least one show cancellation due the the vocal problems I mentioned above - the Morecambe Gardens one I saw being just before that. Where that tour was fairly short, and concentrated on Midlands venues, two months later Scotland was also added to a longer schedule. In addition to the Dundee show Glasgow (the previous evening) and Edinburgh (25th) were played. I made it to Edinburgh but not Glasgow so a review of that show may eventually appear on this site. Four days after the Dundee show the band were filmed for what became one of the initial releases on the Fotodisk video series. It was recorderd at Manchester Ritz and the video gave the game away, "Ian Gillan is Garth Rockett And The Moonshiners". You can find some stunning pictures by Sue Burton from that show on the DPAS site. As you probably recognise the photos are taken from the sleeve of the video so I can take no credit for them. Ten years on the soundtrack was released on the resurfaced Purple Records. An interview from after the Morecambe show is here. This page is Copyright © Doug Anderson 2000 - 2002. Created: 24 June, 2002. Last updated: 29 June, 2002.